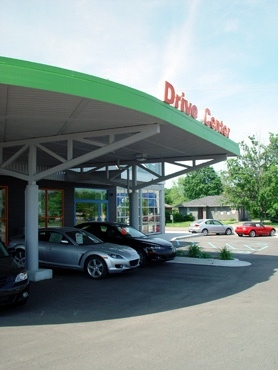 Using corporate approved building components, this addition to a large auto dealership added a zippy modern look to the facility. 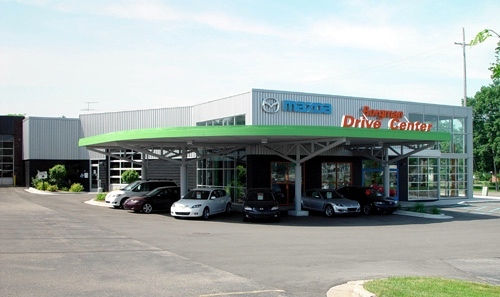 The completed new Mazda Facility from the northeast. Fun with the corporately mandated materials and arrangements. 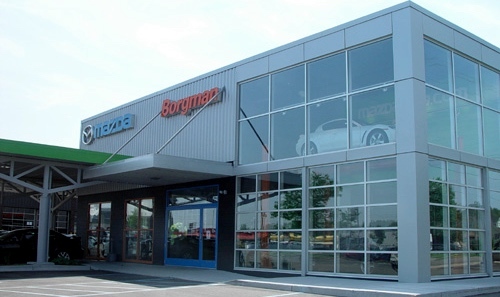 Mazda Facility main entrance, seen from the northwest. Note the jacked up sports car in the upper loft. Original construction drawing for the new Mazda Facility at John Borgman Ford. Formed steel canopy. Provides shaded view area for parked vehicles. Simple, clean exposed structure.